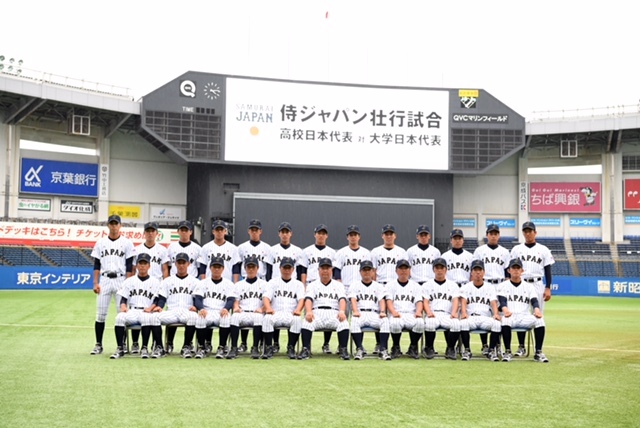 Japan’s U-18 National Baseball Team played an exhibition match against their counterpart of University National Team at QVC Marine Stadium in Chiba before the near-capacity crowd on the night of Saturday, August 27. Tatsuya IMAI of Sakushin Gakuen High School which won 2016 National (Koshien) Championship pitched two scoreless innings with five strike-outs. Shoma FUJIHIRA and Seiki TERASHIMA pitched one inning each without allowing any score. All of them are strong candidates in the first-round draft on October 20, 2016. The College National Team won the game 5-0. 2016 XI BFA U-18 Baseball Championship in Taichung is scheduled to be held in Taichung from August 30 to September 4. In Group A, Japan will take on Hong Kong at Intercontinental Stadium and, in Group B, Korea meets Philippines at Taichung Stadium to open up action on August 30, 2016. Indonesia and host Chinese Taipei are in Group A, and China and Thailand in Group B. The total eight teams will proceed to Super Round, after the Opening Round, and to the finals on Sunday, September 4.